The Rosa dei Venti apartment is located in the beautiful Livigno, in a structure completely renovated in 2013 that maintains the classic alpine style Livignasco, in wood and stone. This lodge used to have a stable and a barn too. Here you can find now our Rosa dei Venti apartment which has been furnished with care and equipped with all comforts. The apartment Rosa dei Venti has its own heating system and is equipped with underfloor heating: walking barefoot is so nice! The apartment is also soundproof and is equipped with a ventilation system for better air quality. The Rosa dei Venti apartment is located in Livigno, in a strategic position near the lake of Livigno, one of the most peaceful and picturesque areas of Livigno. Near the holiday apartment Rosa dei Venti is the Aquagranda center, which with its 20.000sqm will give you real moments of relaxation and well-being. Just 150 meters away is the beautiful cycle path, perfect for picnics with friends or walks along the river. Also near the Rosa dei Venti apartment there is a free bus stop that will quickly take you to the new Cassana cableway (no. 30 on the map of the ski lifts). In summer Livigno and all the nearby valleys are real treasures of nature to be discovered. Livigno is the ideal destination for your holidays, both for athletes and for families with children. The Little Tibet is perfect for enjoying your holidays in contact with nature: hiking, trekking, biking, horseback riding, tennis, golf, skating, paragliding, hang-gliding... these are just some of the sports that can be practiced in this wonderful period. Lovers of relaxation can enjoy the wellness of the Aquagranda center, the sun on the cycle path or be lulled by the peace of the Lake of Livigno. Livigno will know how to conquer you! In winter Livigno turns into an enchanted place, perfect for lovers of snow and winter sports: skiing, telemark, snowboarding, snowshoes, fat biking, horse riding on snow, snowmobiles... these are just some of the sports that can be done during the winter in Livigno. Lovers of relaxation, on the other hand, will be able to relax even with family or friends, you will never get bored at Piccolo Tibet! Let yourself be conquered by the gentle slopes, the unspoilt nature and the high altitude sun. 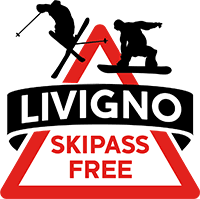 Rosa dei Venti Apartment participates in the Skipass Free offer. This means that from 1st December to 21st December 2018 and from 6th April to 1st May 2019, the ski pass is included in the price of the stay.